The African Black Oystercatcher (Swarttobie) and White-fronted Plover (Vaalstrandkiewiet) are the only two beach breeding birds along the Overstrand coastline. Shorebirds nesting on the ground are very vulnerable to beach visitors and dogs during summer months when they breed. A project forming part of BirdLife Overberg’s CleanMarine campaign aims at educating beach goers to stay clear of these nests. Nest warning signs, such as these illustrated, warn beach goers of the presence of these nests. 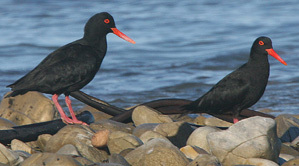 The oystercatcher is a large black bird with pink legs and a bright orange bill. They have a global population of only 6600. 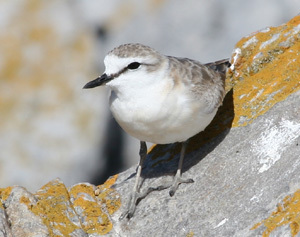 The plover is a small, well camouflaged bird that always returns to the same nesting area and may pretend to be injured to distract perceived predators from their nest. The numbers of these plovers have declined by up to 60% over three decades. Shore-nesting birds are very sensitive to threats entering their breeding territory. They become defensive, stand up from the eggs, start running and even fly away. If one remains too close to the nests it could cause defensive behaviour, often attracting the attention of nearby predators to the nests and young. Extensive time defending their territory while off the nest can also cause eggs to fail or the chicks to die due to heat exposure. The breeding success of these two species is rapidly declining due to modification of beaches by human expansion and development. The success of each nest may therefore be critical for the survival of that species. Birds become agitated and leave the nest when one is too close. One should stay at least 30m away from these nests and walk on the wet sand and not in the dunes when nests are present. Give these nesting birds some space and avoid designated nesting areas. Also note that even well-trained dogs can be perceived as a threat during breeding season. Dogs should be leashed on beaches until the end of the breeding season in March. Negotiations are currently underway with representatives of the local municipality in view of the possible development of a zoning system for dogs on beaches. This is being implemented very effectively in other municipal areas in the Western Cape Province.